Lu, Q.; Arroyo, M.; Huang, R.
An analytic formula is derived for the elastic bending modulus of monolayer graphene based on an empirical potential for solid-state carbon atoms. Two physical origins are identified for the non-vanishing bending stiffness of the atomically thin graphene sheet, one due to the bond-angle effect and the other resulting from the bond-order term associated with the dihedral angles. The analytical prediction compares closely with ab initio energy calculations. Pure bending of graphene monolayers into cylindrical tubes is simulated by a molecular mechanics approach, showing slight nonlinearity and anisotropy in the tangent bending modulus as the bending curvature increases. An intrinsic coupling between bending and in-plane strain is noted for graphene monolayers rolled into carbon nanotubes. 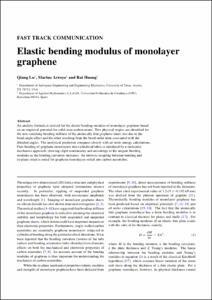 Lu, Q.; Arroyo, M.; Huang, R. Elastic bending modulus of monolayer graphene. "Journal of physics D. Applied physics", Maig 2009, vol. 42, núm. 10, p. 1-6.